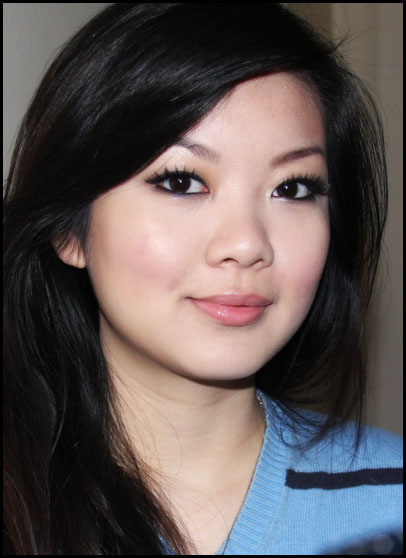 This makeup tutorial is going to be a very simple, understated, evening makeup. Start by patting a cream eyeshadow onto the lid. I am using my favourite - Benefit Creaseless Cream Shadow in Strut. Using a fluffy blending brush, blend and soften the edges of the cream eyeshadow. I am using the equivalent of a MAC 217 blending brush. 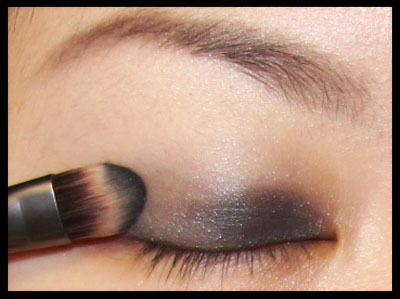 Then, pack a dark green eyeshadow onto the centre of the lid. I am using the dark green side from the NARS Eyeshadow Duo in Rajasthan, and the equivalent of a MAC 239 brush. This is the cool bit. 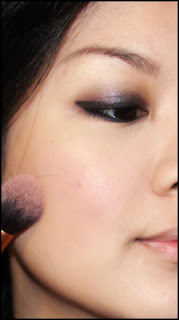 Pat a glittery purple eyeshadow onto the outer and inner corners of the eye. 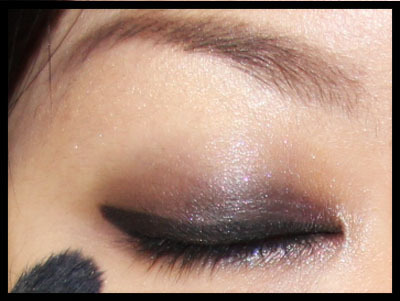 I am using Ameli Sparkle Spot Eyeshadow in Arabian Night. 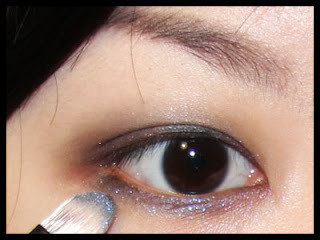 Then, take a glittery blue eyeshadow and apply it to the lower waterline. Excuse how scary my eye looks here. It's actually pretty funny how intensely I am staring at nothing in this picture. Oh, and I used the MAC Mineralise Eyeshadow in Blue Flame here. Next, line both your upper and lower lashlines. I am using Clinique Brush on Cream Liner in True Black on a Real Techniques Pixel Point Eyeliner brush. 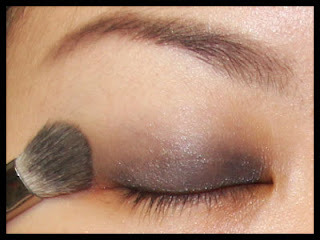 Then, pat a highlighter onto your brow bone and in the inner corners of your eyes to lift and open up the eyes. I used the Jemma Kidd Dewy Glow All Over Radiance Creme in Rose Gold. Clean up underneath the eye with a concealer. I am using my favourite combo - the Bourjois Healthy Mix Concealer in #52 on a fluffy blending brush - the equivalent of the MAC 224 brush. Apply a contour powder and blush. I used my Sleek Contour Kit in Medium and the MAC Mineralise Blush in Gentle. Then, I applied Estee Lauder Pure Colour Lipstick in Crystal Baby and NYX Brush On Lipgloss in Lilac Field. I hope this was of some use! I hope you have the most wonderful week!